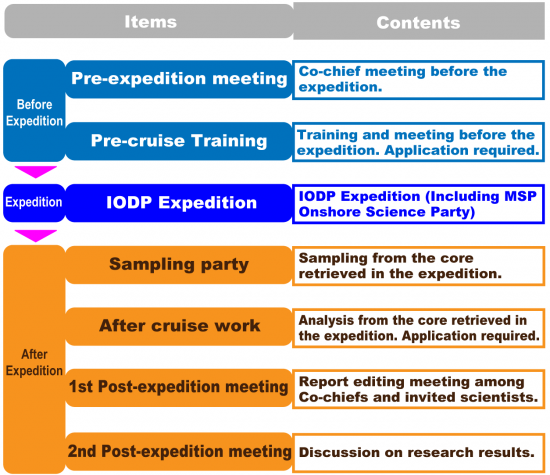 J-DESC/JAMSTEC provides travel support for the Science Party of IODP Expedition to advance the International Ocean Discovery Program (IODP) in Japan as described in the following chart. The support is for those who apply for the Science Party through J-DESC, and selected to the Science Party of IODP Expedition. J-DESC/JAMSTEC may not support the scientists who do not belong to Japanese institutions located in Japan or do not live in Japan for the period of each activity. Although JAMSTEC commissions the scientists to travel for the period of the expedition and related activities, be sure to have personnel management and disaster compensation by your affiliation throughout the travel period. Please DO NOT buy tickets before JAMSTEC commissions you. JAMSTEC will basically make a reservation for your international flight. Those who are selected to the Science Party of IODP Expedition should submit the registration form to J-DESC Support Office. Following items for overseas travel are also supported. The report should be submitted within two weeks after each activity. The report will be on the J-DESC website and will be submitted to the committee. Acknowledge IODP and JAMSTEC support when you publish on the scientific papers and inform of the title, name of paper, publish year etc of your scientific paper. Your personal information will be used only for travel support and properly filed by JAMSTEC Personal Information Protection Rule.